I received this book for review on my blog! As always, my reviews are fair and unbiased. Welcome, fellow humans (and others), to the the world of FUN SCIENCE! I'm Charlie, also known across the internet as charlieissocoollike. In my book, I'll be taking you on an awesome journey through the cosmos, beginning with the Big Bang through to the Solar System and the origins of life on Earth, all the way down to the particles that make up everything around us (including you and me!). Expect frequent digressions, tons of illustrations of not-so-sciencey things (NB a microwave flying through space), and pages packed with my all time favourite mind-bending science facts. So, get ready for a faster-than-the-speed of-light (OK, not quite) tour of all of the best and most interesting things that science has to offer us… and most importantly: WELCOME TO THE UNIVERSE! I've always had a love for astronomy, galaxies, the Earth and everything that's not yet been discovered (underwater city theory? ), so Fun Science reignited that love for those things. 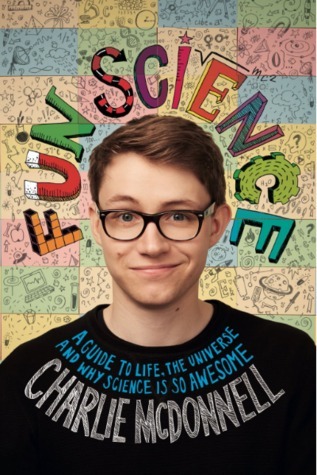 I'd heard of Charlie on YouTube before and saw some of his videos so I knew that there would be a really distinctive, friendly kind of narrative to Fun Science (even if I wasn't the best at Science at School). Fun Science makes learning things cool. This is the first thing that I learn when I delve into the book. We first learn about The Universe, hence everything from 13.8 Billion years ago in time to learn that we, in fact, are all made of the Universe (and how cool are the illustrations? THE BEST). There are big facts, smaller ones, ones you might have heard before and ones that I was kind of surprised to find out about the Universe, the solar system, the big bang and even our brains. It's these interesting and good-to-know facts and descriptions that make Science actually...fun. Being twenty years old and looking back, I did my fair share of Science at school and it wasn't my favourite subject. Astronomy, on the other hand, was one of my favourite things to learn more about (including reading countless things about stars, other solar systems and comets). Fun Science actually covers some of these things and more, like the nervous system, our bodies and life itself. The strikingly intricate and wonderful illustrations are fun and lively and Charlie's distinctive voice shines through as he talks up the Universe to the readers. Overall, Fun Science is just that: it's everything you thought was hard and unnecessary made fun and actually amazing to read. I've already been trying out some of my new knowledge on my friends and family and they've even delved into the pages themselves. After reading Fun Science I honestly feel like I've just sat through the best Science lesson of my life, complete with jokes and easy to learn and understand facts and not-so-Science things too. A definite five-star firework of a book. Have you read Fun Science? Let me know in the comments or at @LittleMemoirs on twitter using the tag #FunScience.